In part 1 of my review of Spec-Ops Brand THE Pack, I mentioned its impressive 2550 cubic inches of internal storage space. That’s a lot, but it’s also a little difficult to visualize. 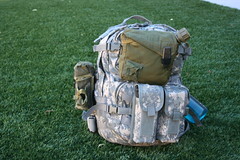 With that in mind, I stuffed THE Pack full of most of the things that I though a three day pack might need for a field operation. I started stuffing in gear like a GPS, spare socks and pants, and knifes and it quickly became apparent that I was going to easily fit what I needed in THE Pack. Using the GRID-LOK accessory loops, I attached 2 Spec-Ops Brand X2 magazine pouches, but I wanted to demonstrate the flexibility of the GRID-LOK system and also attached an old ALICE M16 magazine pouch, an ALICE 2qt bladder canteen and strapped a 1 liter Nalgene bottle on with a carbineer. When all the gear was in, I had some extra room that I would normally use to stuff in rations, but since I didn’t have any MREs handy, I topped it the load off with extra boxes of ammunition, a spare weapon and magazines for it, and a poncho liner. 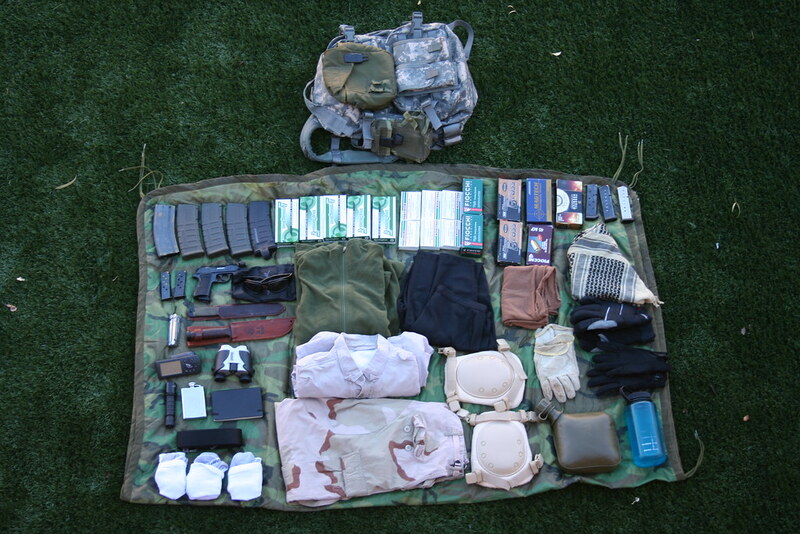 A pair of BDU pants, a 5.11 Tactical shirt, 3 pairs of socks, a pair of Patagonia base layer pants, an REI Fleece shirt, a poncho liner, a keffiyeh, a desert scarf, 3 pairs of gloves, kneepads, a Blackhawk emergency belt, a Garmin III+ GPS, a Kabar fighting knife, a Cold Steel throwing knife, a pair of Wiley X goggles, a Surefire G2 flashlight, a pair of Bushnell binoculars, a Moleksine notebook, a hip flask, a Leatherman Wave, a 2qt Bladder canteen, a 1 liter Nalgene water bottle, a Walther PPK with 2 spare magazines, 5 spare M16 magazines, 3 spare magazines for my 1911, 470 rounds of .223, 274 rounds of .45 ACP and 24 rounds of .380. Had I used a load plan, and shucked the ammo out of the boxes and into magazines, I have no doubt that I could have put even more in THE Pack. Loaded up, the entire thing weighed a manageable 55 lbs and rode rather comfortably on the back considering THE Pack has no internal or external frame. The external cinch straps and combo of chest and waist belt help tighten up the load and distribute the weight for an easy carry. One of the real advantages of THE Pack is the GRID-LOK loops all over the back, bottom and sides of THE Pack. If the circumstances called for it, a hydration system fits in an internal pocket and I could have ditched the external canteens and water bottles and used that space for more magazine pouches. The combination of external pouches and gear that can be strapped on is virtually limitless, and the strength of the loops and the stitches holding them on means you don’t have to worry about the weight of the load you’re strapping on. If you can lift it onto your back, THE Pack can hold it. This entry was posted in Back Packs, Bags, Gear. Bookmark the permalink.